"The Whole Nine Yards" is a movie so stunningly bad and so incredibly inept that, for a brief while, I debated whether or not the film actually deserved a review from me. Shortly after that question entered my mind, the movie entered #1 at the domestic box office, thus providing a purpose of putting my own two cents in on this mess. A late warning is, I guess, better than none at all. What's even more disheartening is the continuing success of the picture; while it tramples the box office competitors, great and important works like "Magnolia" and "Wonder Boys" are disappearing from the list almost as soon as they are introduced. How sad that decent moviegoers are missing films that actually have something to say and are flocking to those that merely have something to mock. The movie is cheaply realized, contrived using material so familiar that we could almost read between the lines of the screenplay. 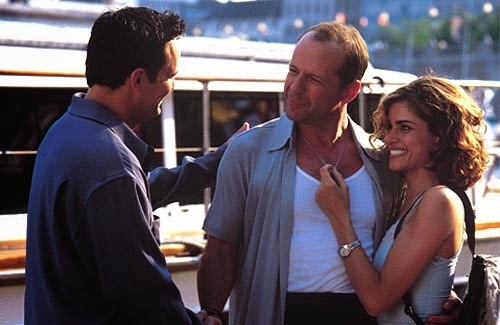 In the story, we meet Jimmy "The Tulip" Tudeski (Bruce Willis), a professional hit man who has moved into a remote neighborhood in Montreal after turning state's evidence against his crime family in Chicago. Tudeski is in hiding to save his own life from his mob boss, as it seems, but his neighbor Nicholas "Oz" Oseransky (Matthew Perry) knows more than he should. You see, Oseransky is a dentist who once worked in Chicago, and thus recognizes his neighbor from that time. The big twists are put into motion by Oz, who is encouraged by his wife to go to Chicago and inform Tudeski's former boss of his whereabouts. As is the case with most mobster movies featuring a wisecracking hit-man and a complete moron (remember "Mickey Blue Eyes? "), this event unleashes a slew of complex developments, in which characters put out vendettas on others, change sides, run amok and constantly find themselves in hot water. But each and every quip is completely obvious; sometimes certain characters get themselves into situations so foreseeable that, instead of chuckling, we feel like hurling. And the characters themselves are undeserving of the talented cast they have acquired. Rosanna Arquette's Sophie Oseransky, Oz's wife, is the most infuriating; she's a fine actress, with more than a couple of respectable movies under her belt. But the plot demands that the character she is portraying has an accent, a French Canadian one that, for some reason or another, sounds vaguely German. Her tone is so bad that it makes Madonna's British lingo in "The Next Best Thing" seem all the more appealing. The only thing worse than the jokes and the characters is how badly packaged the premise is--at one point all seems like a slapstick comedy, at another there is a sense of noir in play. Anyone with half a brain knows that each approach needs its own set of guidelines (noir, for instance, needs an involving story that is not so easily comprehended on a surface level), and virtually no movie can combine the two successfully. Which one works better here? I'd say the comedy, simply because the story has the obvious clarity of general comedies. But don't take that as evidence that one will find something to laugh about here. In the dictionary under the term "horrible," I'd put one of the press photos for this movie. Irritating, unfunny, predictable, corny--words like these and worse are the only ones that can fittingly describe the mess that is "The Whole Nine Yards." Who in their right mind would pay money to see this atrocity? The same people who laughed at "Analyze This," I gather. That movie, too, was an insipid comedy which used professional crime-doers as the source of inspiration; unfortunately, not even the competent dialogue sessions have translated well between the films. Whereas the former contained one or two smiles, "The Whole Nine Yards" is stupid from beginning to end, without one single moment standing out from the others. A shame it is to see a great ensemble cast get mixed up in a movie that deserves to be thrown nine yards down a football field.